With today's management goals of producing quality whitetail deer, seed blends of forage cereal grains and clovers should be chosen for your food plots. You want to choose a variety of clovers based on fast growth and long maturity. Fast-growth clovers such as crimson clovers and berseem clovers produce a tremendous amount of growth early in the hunting season. White clovers and arrowleaf clovers produce most of their growth in early spring to late summer. A blend of these varieties produce year round at a rate of 25%+ in proteins. Both forage cereal grains and clovers produce the maximum amount of forage and protein per acre to insure whitetail deer survive the winter in top shape. Seeds should be chosen with consideration of soils, climate, budget, and nutrition. 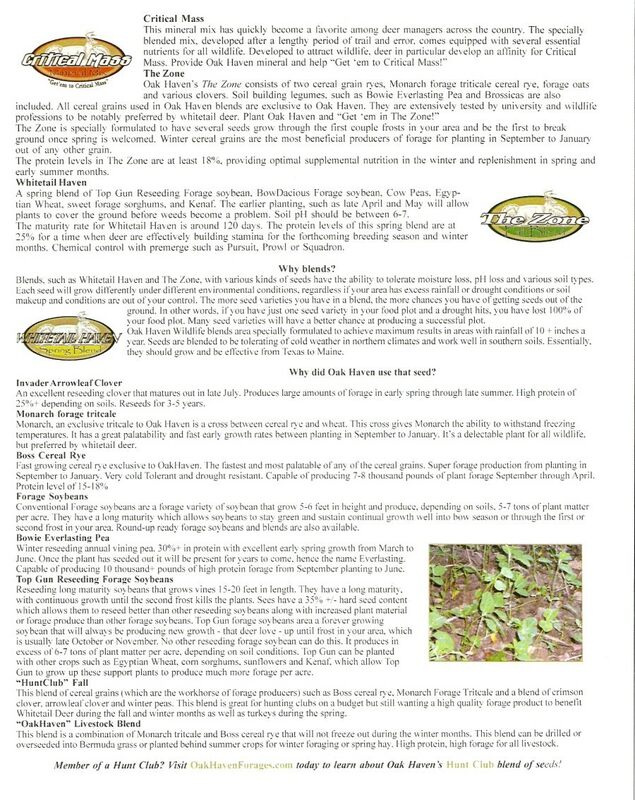 Many hunting clubs are on a budget, but still want a good quality forage seed. They should choose cereal grains such as forage wheat, triticale, cereal rye, and oats. Many people are unaware that these are forage varieties of seeds. Forage cereal grains are chosen for their great taste and fast growth from planting time to late winter. This early growth is necessary to ensure proper forage during the stress times of whitetail deer in late fall and early winter rut times. Most of these cereal grains will produce more than 18% protein. Whitetail deer need only 16% protein to ensure proper diet. Fertilizers are the second-most important part of food plot nutrition behind ph/liming. Proper soil samples should be taken from 3 or 4 locations in each food plot and mixed together. Each foot plot sample should be sent to your local university or soil lab for testing. Your local county agent can supply you with containers and information on soil sampling. In about 2 to 3 weeks, you should receive a printout telling you how much nitrogen, potassium, phosphorus, and lime per acre you should apply to your soils. Access to equipment is sometimes a problem for many hunters. If you have access to equipment such as disks, bushhogs, harrows, rollers, or any other such equipment, your tasks of food plot preparation and maintenance will be easy. For hunters with limited equipment, it might be more time consuming. Most hunters have access to tillers, weed eaters, blowers, rakes, and home-made drags. Many small pieces of equipment can be bought or made to use with 4-wheelers and lawn mowers. Anything that can rough-up the soil, remove grass and weeds, and cover seeds will produce a great food plot. Food plots and real estate have one thing in common.....location, location, location! Pick the best location on your property that is well drained and level. Avoid areas that flood or hold water for more than 24 hours. A good rule in choosing a food plot location is to look for natural vegetation growing in the area. If the area has several different varieties (8 or more) of natural weeds that are green and growing tall, this tells you that the area can support your food plot. If the area has only a few weeds and they are short in height and appear to have poor growth, it probably also has poor soils. Sometimes it is cheaper to hire a bulldozer to create a new food plot on better soils than to keep spending time and money on poorer locations. Properly preparing your food plot is very important in ensuring plant emergence. Start with mowing and disking your food plot. Smooth and level food plot by dragging a harrow. Do all and anything that can level and remove dead grass in the food plot. After leveling, broadcast seeds evenly over the plot. Cover, depending on seed type and moisture, one-quarter to one-half inch in depth. Small seeds such as clovers can be rolled packed if the soils are not heavy clay. Four-wheeler tires are excellent roll packers. 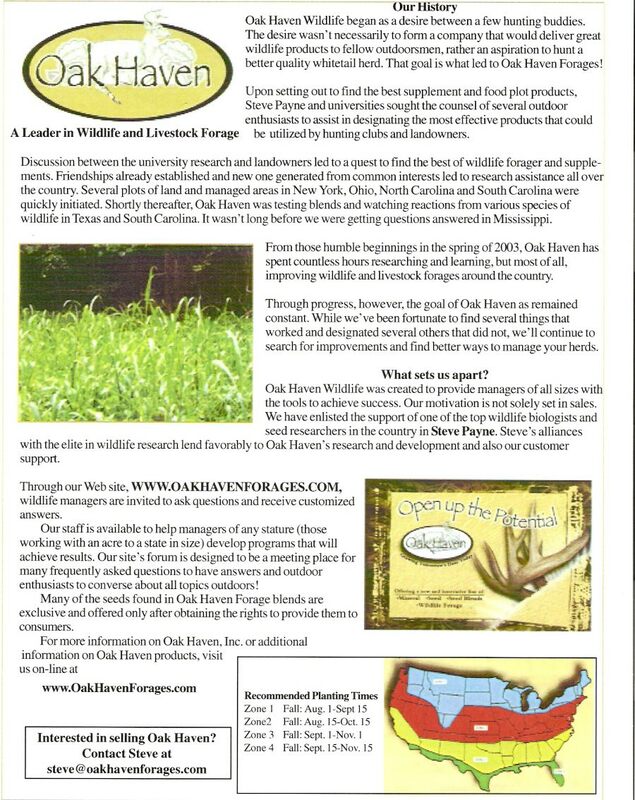 At OAK HAVEN FORAGES, LLC, we test hundreds of forage seeds each year. We do not want to just find a cheap seed that does not perform to our standards. We look for a forage quality seed. We look for a seed that produces in excess of 2500 lbs of plant matter per acre from planting time to mid-winter. We look for a seed that is preferred by wildlife. We look at nutrition levels, protein content, digestibility, and climate tolerance. Oak Haven owns, grows, and sells the best performing seeds and does this at reasonable prices! Every area has soil and/or climate differences from other areas, which is why seed blends work best. Constructing a growth cage in each food plot will determine which forage seeds work best in your area. Growth cages should be at least 4' high and 3' in diameter using close wire-mesh fence held in place by tee-post. Keeping a check in growth patterns inside and outside of your cages will assist in determining soil or seed-type problems and will show whitetail deer use. Look for excellent growth inside the cage and deer use outside. Habitat management is the first rule in managing whitetail deer and turkey. If habitat is managed properly, the carrying capacity of whitetail deer will be higher. You will see more deer and you will harvest better quality deer. Management practices such as prescribed burning, selective thinning, fertilization, and good food-plot systems are the keys to successful hunting of quality whitetail deer and turkey. With today's changing times, increase in non-hunting groups and increase in suburban living, we as hunters should conduct ourselves properly in order to create a positive perception from the general public about ethical hunting. Many landowners are now leasing their lands which is making public hunting areas overcrowded. If you hunt next to others who are practicing quality management, try your best to work with them toward the same goals. If you hunt on public ground, be aware of rules and regulations. Keep in mind that other hunters could be present also. If you look, act, and talk like an ethical hunter, people will respond to you more positively. If hunters all work together, the fight against ethical hunting will be weakened. If your food plot shows little use or only nocturnal use, there is probably too much hunting pressure on the deer. You want deer and turkey to utilize mineral pits and food plots, so decrease the amount of time hunting over the same food plots. Alternate your hunting area or food plots to allow deer to feed free from human intrusion. Reduce your activity around food and mineral plots. Reduce excessive vehicle use on the property. Whitetail deer are very intelligent and they can pattern you more easily than you can them. Too much hunting pressure might even run deer off your property entirely, which in turn would only benefit your neighboring hunters. Inoculates is live bacteria that must be kept cool and moist. Many seeds that are pre-inoculated are put into seed bags. After a week or two the live bacteria will dry out and die. Seeds need to be inoculated at planting time to ensure living bacteria. Seed inoculate will come in a sealed plastic bag with an expiration date and must be kept cool until use. There are different types of inoculate for different types of legumes. For example, clovers require different inoculants than soybeans! Sometimes inoculates are hard to find. An alternative is to use a good ammonia nitrate fertilizer such as 13-13-13. This adds the extra nitrogen that inoculates would have added without hurting the plants. If clovers, soybeans, or cowpeas have been grown for two or more years in the same food plot or field, it will not be necessary to use inoculates because of the bacteria already present in the soil. Moisture is very crucial to the seed-growing process. Moisture causes the dry seed to swell and activates the growing process. Never plant when the soil is dry unless rain is expected within 4 or 5 days. Overworking the soil in food plots tends to dry the soil. Work your soils 15 to 20 days before planting, which allows the soil to regain moisture. Listen to the weather man. Plant seeds and lightly cover them a day or two before expected rain. There is a misconception of the meaning of 'no-till'. Many people believe you can just buy some seed, throw it out, and it will grow. Some may come up, but 80% of it will likely die. Seeds must have soil contact and after some growth the plant must have sufficient sunlight. Dead grass and leaves will prevent seeds from having proper soil contact and/or proper sunlight. The better the land preparation, the better the results! Ph is the scale used to measure the ability of soils to provide fertilizers or nutrients to plants. Measurements less than 7 are said to be acidic, more than 7 alkaline, with exactly 7 being neutral. Soil ph should be kept between 6 and 7. Fertilizer applied to food plots can not be utilized by plants very effectively outside this range. 'Liming' food plots is one of the most important and most economical factors in food-plot maintenance. After adding lime, it will take between 3 to 6 months for the soils ph measurements to change. There are several factors to consider when deciding a planting date. The most important is geographic location, followed by weather conditions. Here in north Mississippi, I like to plant in late September to early October depending on the rainfall and presence of cooler temperatures. It is possible to plant here as late as mid November. I look for temperatures of low 70�s at night and mid 80�s in day. The further north you are located the earlier these conditions are met and vice versa. Oak Haven Forages� website contains a planting-dates map which can be used as a good general rule when weather patterns are normal. Under good growing conditions cereal grains will grow six inches in one week. Here in the south, it is common to plant around Labor Day weekend to get the maximum amount of growth before �bow� season. This can be risky, especially in the south, because of the likelihood of hot, dry weather. Remember, these are COOL-season, small grains that cannot tolerate the heat and dryness of late summer! It is usually best to prepare your plots ahead of time, but plant only when conditions are right and hope they don�t change! Planting depth is a very important factor in plant emergence. Seed size usually determines seed depth. Small seeds such as clover may only need a depth of 1/4 inch, where large seeds such as corn and soybeans may require 3/4 inch depth. The moisture zone of an area also should be considered. The moisture zone is how far down one has to dig to find moisture. Shallow moisture allows for shallow seed depths and vice versa. Habitat and wildlife numbers dictate planting rates. Oak Haven Forages bags are 55# to the acre under normal conditions. If you have poor habitat such as closed canopy that will not allow sunlight to penetrate to the ground, poor soils, or improperly managed timber along with high deer densities, the planting rates need to be higher. Higher rates on these blends might be 75# or even higher. Normally, though, 75# will be enough. Remember that if a higher planting rate is used there also has to be a higher fertilizer rate, which makes proper Ph even more crucial. If your area is properly managed, you will only need one 55# bag per acre. Most fall plants such as forage wheat, cereal rye, triticale, and oats require at least 4 to 6 hours per day of sunlight. The hours from 10am to 2pm are important for plant growth. When leaves of hardwoods fall off, plants will usually receive more sunlight. Fire lanes and roadbeds that are at least 20' in width, especially those which run east and west, will usually receive adequate sunlight for food plots. Natural openings of at least 30' should also receive enough sunlight. *Note -- summer food plots need more sunlight (around 8 hours per day).